If you need complete removable dentures, or if you already wear them, you probably share some of the same concerns of many people about dentures. How can you prevent the dentures from slipping around or falling out and embarrassing you? Will you be able to speak and eat comfortably with dentures? Some people are concerned about jawbone shrinkage and facial collapse that eventually occur when all of your natural teeth are missing. Dental implants are the most effective and natural-looking way to replace missing teeth, but for many people, implants are not within their budget. Affordable dental implants are an effective alternative in securing your dentures. An implant mimics the structure of a natural tooth. Implants are surgically implanted in your jawbone. After they heal, your dentures are secured to them. What Affordable Dental Implant Options Are There? 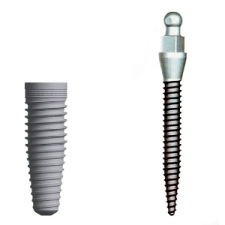 Mini dental implants are ⅓ the diameter of standard implants, and they will save you half the cost. Although your dentures won’t have the same stability as with standard implants, they will be much more stable than complete removable dentures. The surgery and healing time are faster than standard implants. Your dentures can be secured with as few as two mini implants, but the more implants you have, the more stable your dentures will be. Snap-on dentures are an affordable option because only two standard implants are used to secure them, instead of the usual four to eight. After the implants are placed and your jawbone fuses to them, the dentures are snapped onto them. Two standard implants are placed in the jawbone, and dentures are snapped onto them. What Are the Benefits of Affordable Dental Implants? When your dentures are stabilized it is easier for you to speak and eat with them. They also give you more confidence, because you won’t have to worry about them slipping around or falling out. The presence of the implants helps prevent jawbone shrinkage and facial collapse. Additionally, when dentures rest directly on your jawbone, the shrinkage is accelerated. Implant-supported dentures relieve the pressure. There is a difference between cheap dental implants and affordable dental implants, so be careful that you respect that difference. The biggest area of dental malpractice lawsuits is over shoddy dental implants work. Making treatment affordable involves using quality materials and techniques in a cost-effective manner. 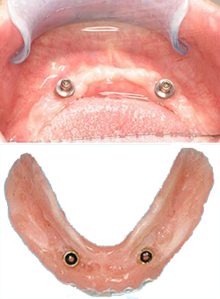 Cheap dental implants involve using sub-standard materials and cutting corners in technique. Quality dental implant placement requires three-dimensional CT scans to ensure that the implants don’t puncture your sinuses, impinge nerves, or interfere with adjacent teeth and your bone structure. Your medical history must be carefully reviewed to determine whether or not you are a candidate for dental implants. Quality implant fixtures must be used and shortcuts must be avoided. Otherwise, the implants can loosen or be incorrectly placed, infection can occur, and the implants will need to be replaced. Dr. Ian Woo is our dental implant surgeon. He is both a licensed physician and a dentist—a board-eligible oral and maxillofacial surgeon. Dr. Woo publishes articles and lectures on various implant dentistry topics. He is a diplomate of the American Dental Society of Anesthesia, and a member of the American Dental Association, the American Association of Oral and Maxillofacial Surgeons, and the American Medical Association. You can be confident that you will receive exceptional care in the planning, placement, and healing of your dental implants. If you are interested in receiving affordable dental implants of the highest quality, call us to request an appointment, or request an appointment online.